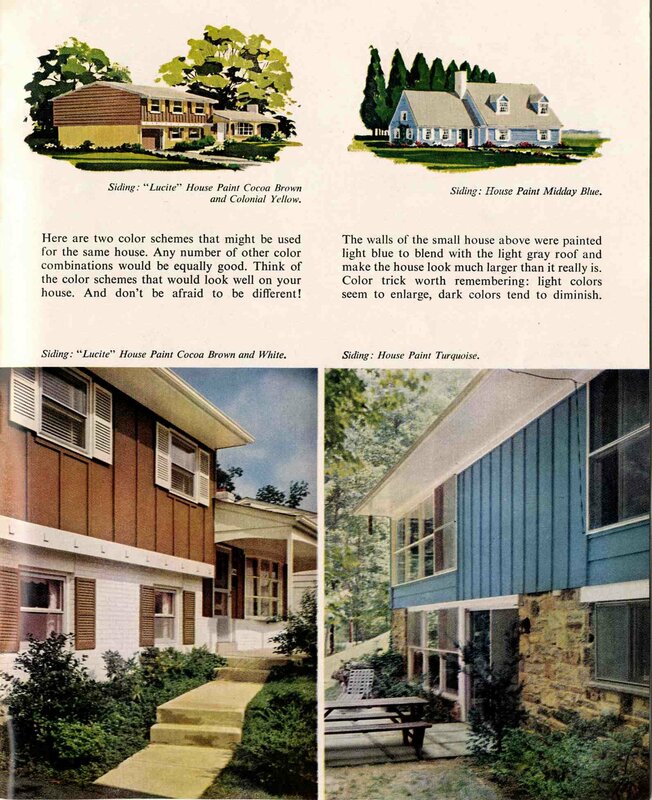 It’s always interesting to look at mid-century paint brochures to see the color combinations that were being promoted at the time. 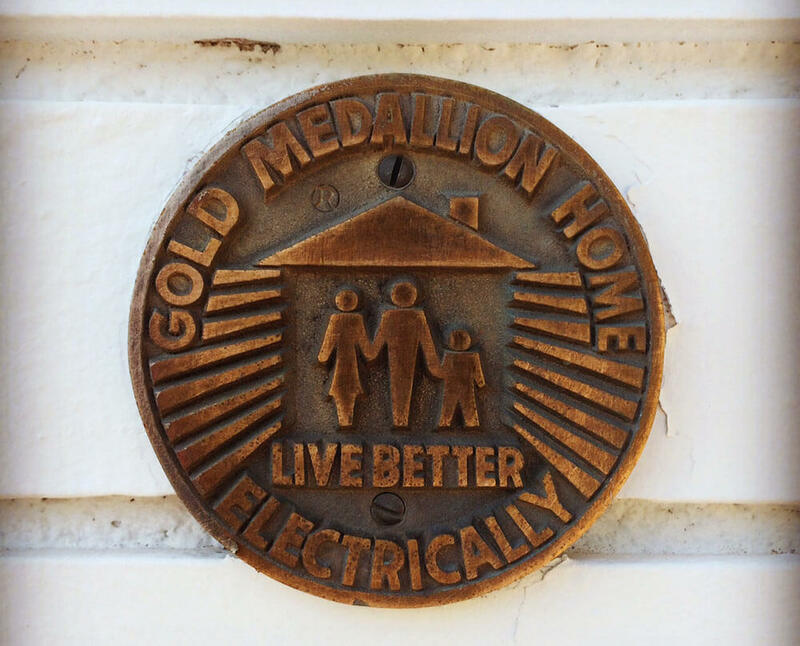 They tend to be so much more… adventurous… than we attempt today. 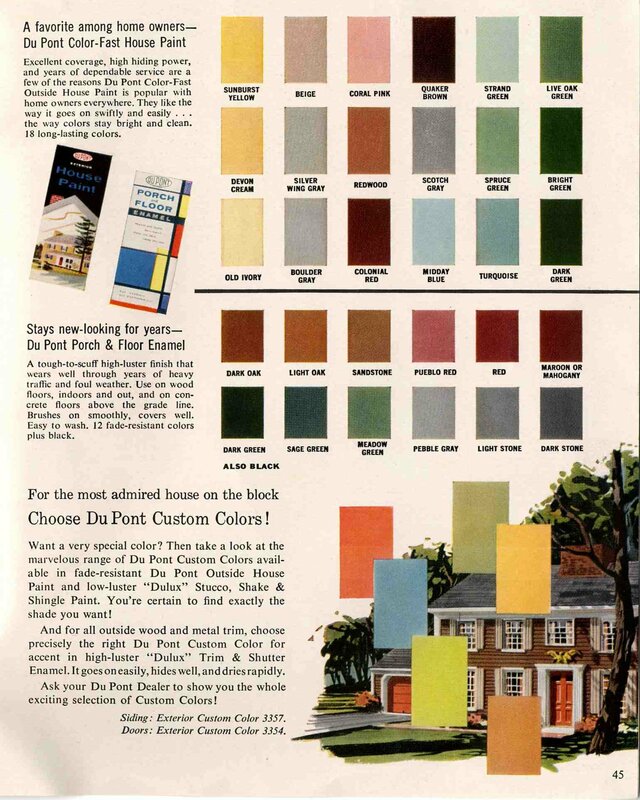 I recently acquired a 1960 brochure from Dupont promoting their paint lines, and it shows a number of palettes for both the interior and exterior. 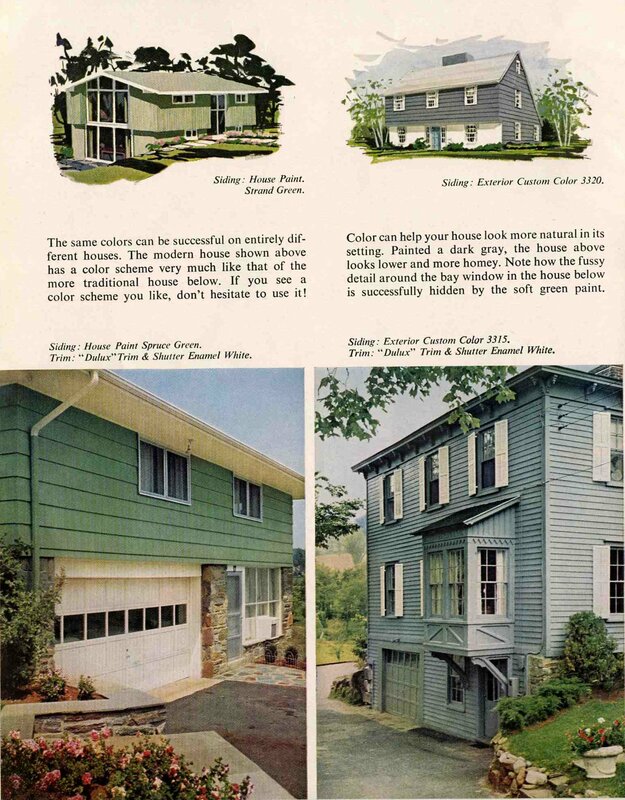 Today, a look at some of the exterior colors that they were spotlighting, in case spring has you thinking about a new coat of paint for your house. 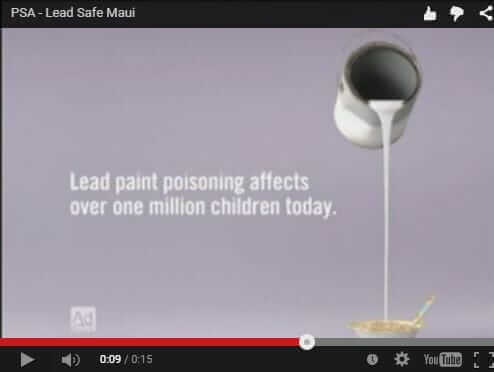 Tip: Click on the first thumbnail below — it will enlarge and launch the slide show. 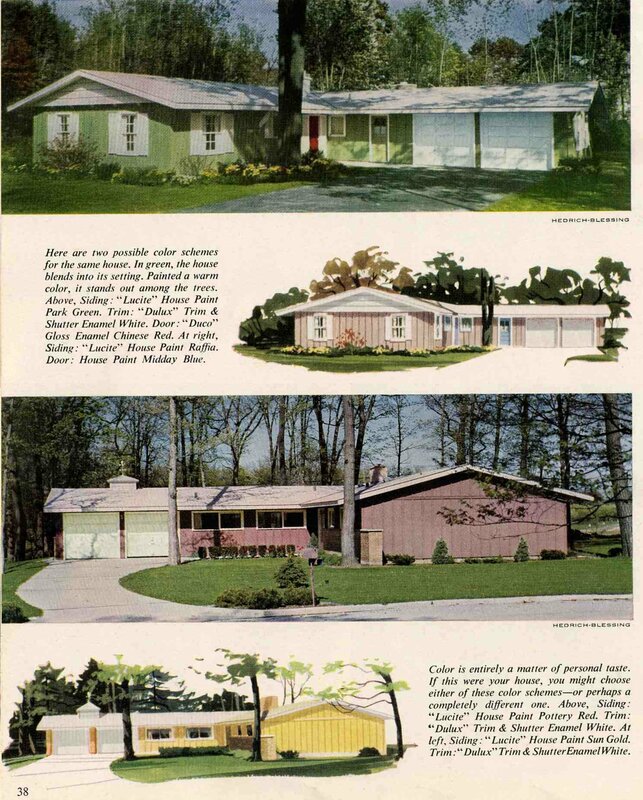 When my husband and I purchased our current MCM ranch home – built in 1972 – it was already pink and white. After we bought it I decided to repaint it as the pink was more like an “old rose” color and just wasn’t “quite” right. 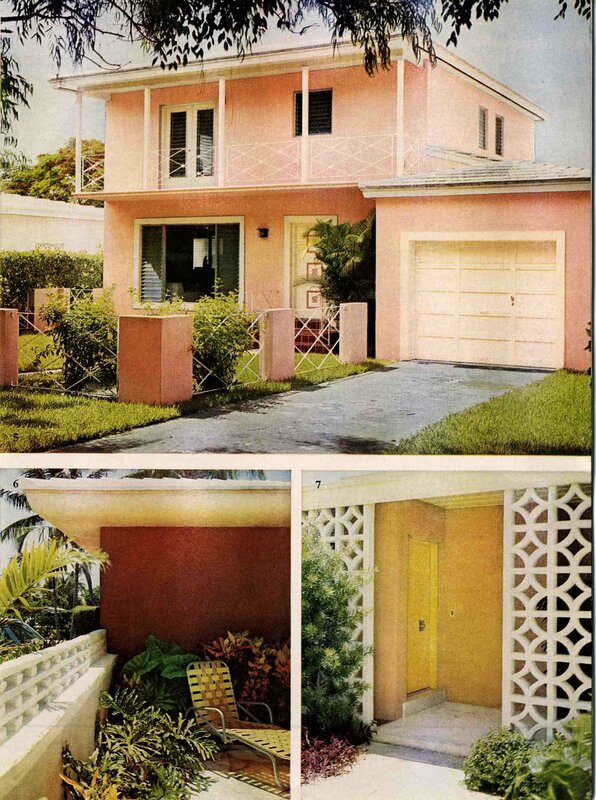 I went with a lighter and brighter shade of pink – more like the Patio Pink but brighter. 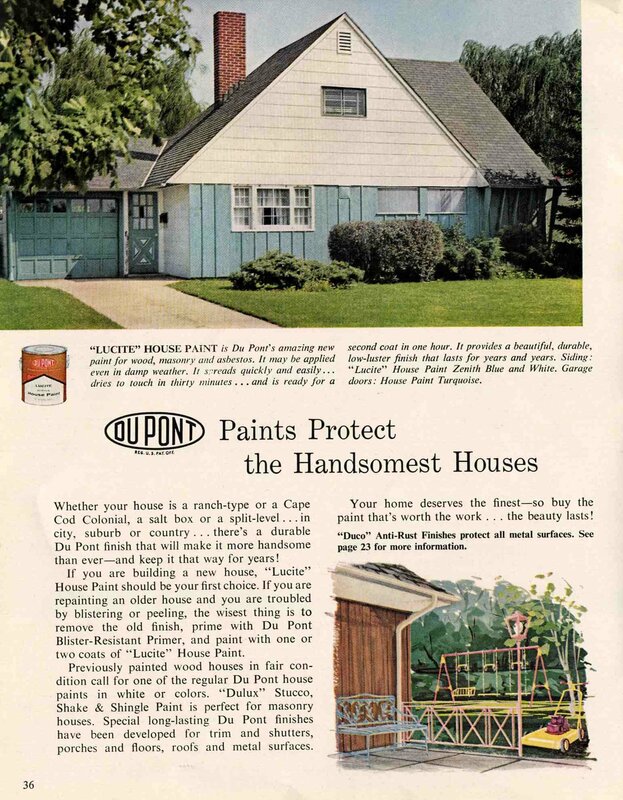 The day I was painting my neighbor (Ms. Busybody) spied me and came over to exclaim that finally the neighborhood was going to get rid of the horrible pink house. 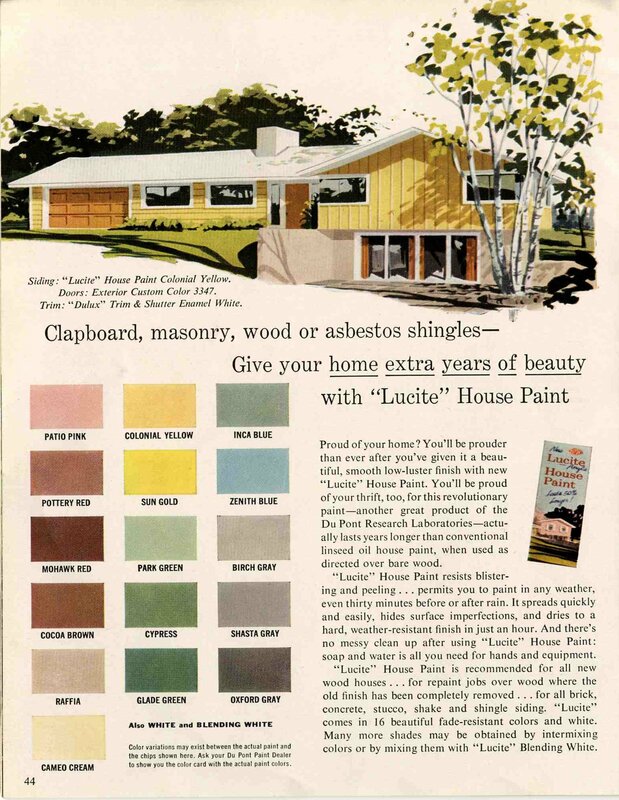 Tongue in cheek I told her that actually one of the reasons we fell in love with the house was because it was pink and that actually I was repainting it “pink”! The look on her face was worth a small fortune. 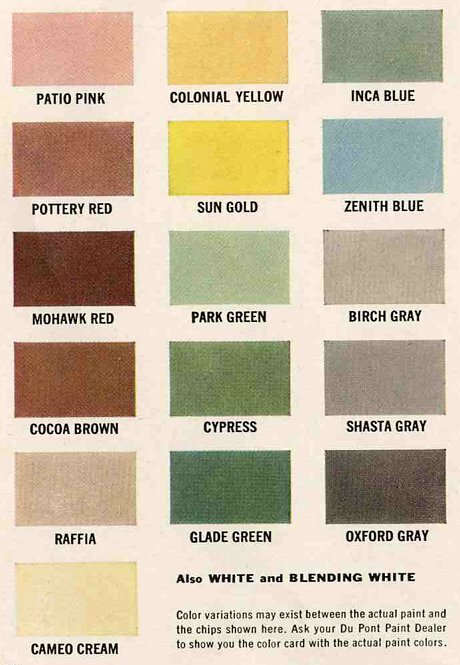 I’m looking for a 1964 house paint accent color. 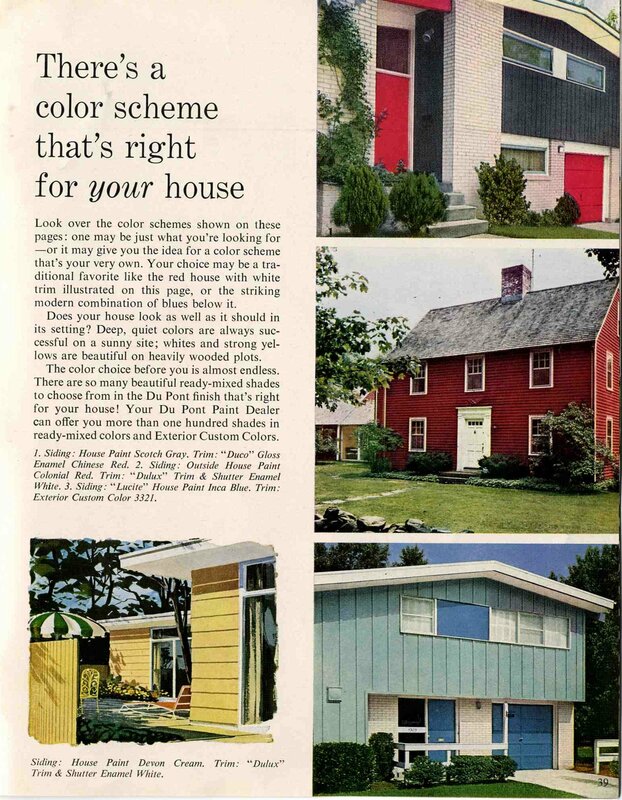 Really want a shade of blue. 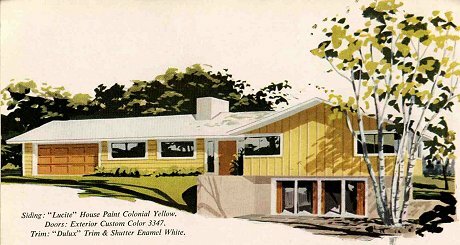 I have a 1964 mid-century modern in a mid-century neighbor. 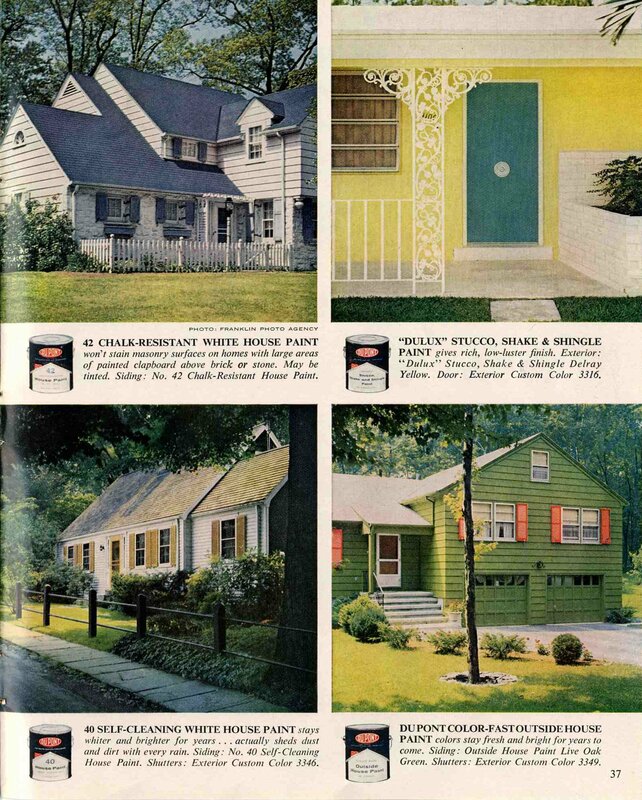 We have many terrific stories about paint colors — check them out! 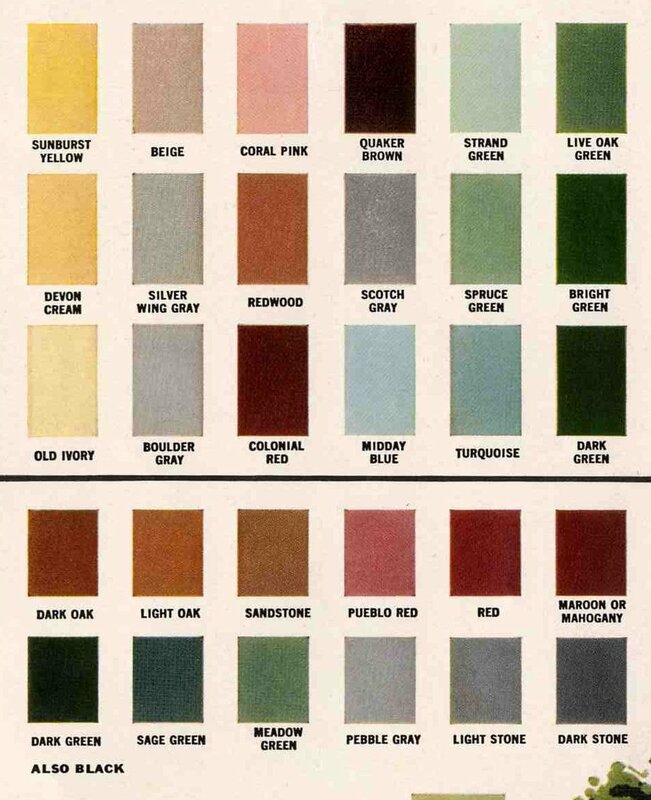 See our complete Paint category here!